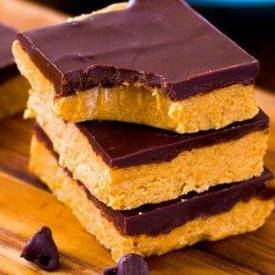 No bake chocolate pb bars! Sally's Baking Addiction Show Us How To Make These Easy Homemade Chocolate Peanut Butter Cup Bars Made With Only 5 Ingredients. Cut Them As Large Or Small As You Want! If You Don't Love Chocolate, You've Come To The Wrong Place! Chocolate’s favorite partner in crime? Peanut Butter of course. Pure velvety smooth chocolate sitting atop a thick Reese’s Peanut Butter Cup center. The perfect marriage of peanut butter and chocolate! !